One woman caught in the scandalous act of adultery; another, rejected and ignored because of her promiscuous lifestyle; another, shunned for 12 years because of a shameful condition; a widow, cast out from society, mourning the loss of her only son. An ugly thread of shame, sorrow and hopelessness painfully weaves its way through the lives of each of these women. After following Jesus for three years, Mary Magdalene observed all these things and more. She also witnessed changed lives, miracles, and the results of restored hope. Watching in amazement, Mary learned from Jesus a new way to look at people. He also radically transformed her life by healing her from demon possession--releasing her from shame. 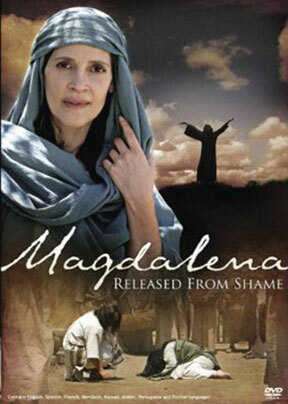 Mary Magdalene acts as both narrator and participant in Magdalena: Released from Shame, as she traces through the story of lives that have come into contact with this man, Jesus, and have been powerfully released from shame. Starring Brian Deacon, Guy Birtwhistle, Rebecca Ritz, Gigi Orsillo, and Shira Lane.